come see the LUMIX cameras and talk to us about Mirrorless & Hybrid! HYBRID: Adding Video Makes the Magic! We are all in a place of transition, looking for a way to set ourselves apart as professionals and keep our businesses healthy. Reinvention is required for survival, it seems, and Hybrid is a great way to add dynamic and contemporary products to your existing photographic services! Wow, where do we begin? We all have cameras that will capture HD video—all we need is to learn the most efficient way to add some movement and a profitable method to create, show and sell eProducts [hybrid mini-movies]! Of course it is all new territory but it is easy to learn from Suzette Allen, who has been teaching Photoshop to photo professionals for over 13 years! She has a way of making it easy and light and loves helping photographers embrace technology. 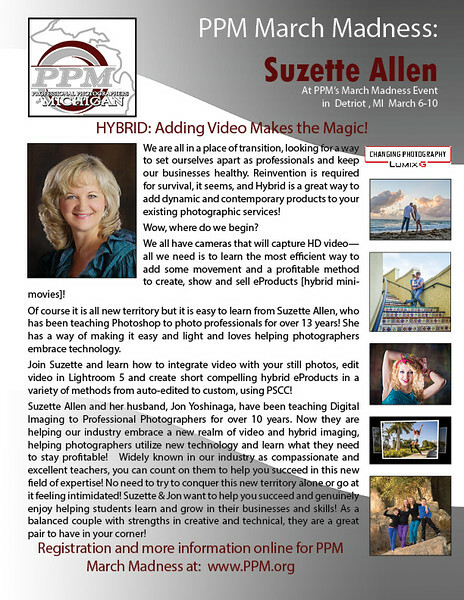 Join Suzette and learn how to integrate video with your still photos, edit video in Lightroom 5 and create short compelling hybrid eproducts in a variety of methods from auto-edited to custom, using PSCC!